The Cardinalfishes are found in the family Apogonidae in the order Perciformes. Fishbase currently lists 207 species divided into 22 genera. Earlier, the genus Epigonus was considered a part of Apogonidae but it has now been moved to the family Epigonidae. The members of the family Epigonidae ventures much deeper down into the ocean than the species in Apogonidae. Cardinalfishes are small and non-aggressive and a handful of species have been successfully kept by aquarists. Most species will prefer to be kept in small schools in the aquarium. 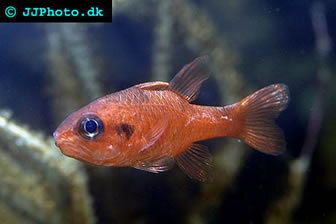 Cardinalfish is found in the Atlantic, Indian Ocean and Pacific Ocean. They are chiefly marine but a few species can be found in brackish waters. On Papua New Guinea, cardinalfish inhabits freshwater streams on tropical islands. The species that live in the ocean will typically stay in shallow water and do not go further down than 100 meters (328 feet). As you might already have guessed by looking at the huge eyes of the cardinalfish, this is a nocturnal creature that will feed during the night. During the day, the cardinalfish prefers to stay hidden in crevices or under ledges. They are known to hide together with sweepers, bigeyes and squirrelfish. Cardinalfishes are generally not territorial. In the wild, most species live in aggregations and they should be kept in groups in the aquarium. Some species live close to invertebrates and form beneficial relationships with them. Cardinalfishes can for instance stay protected by spiny urchins and sea stars. A majority of the species is nocturnal and will forage for food at the bottom during the night. Cardinalfishes feed chiefly on zooplankton and small benthic (bottom living) invertebrates, such as crustaceans. They can also catch very small fishes. When kept in the aquarium, cardinalfishes are known to appreciate fresh and frozen meaty foods, such as shrimp and small fish. With a little training, they can learn to eat frozen processed food as well. They should never be kept on dry food only even if you manage to train them to accept it. If you cardinalfishes refuse to eat in the aquarium, try to coax them into eating by caring out a major water change and offer them live brine shrimp. The brine shrimp should be added to the aquarium when the aquarium lights are off and the room is as dark as possible. Mouthbrooding males are not common in the ocean, but the cardinalfish is one of the exceptions. The fertilized eggs will stay protected inside the mouth of their father for approximately one week. The offspring will then intermingle with the plankton for a couple of months while they develop.